Campaigns allow you to create customized lists within Spiro so you can target contacts for call or email campaigns. You can also access Campaigns from your Assistant. To get started, go to the Campaigns tab in Spiro and name your Campaign. Next, click "Add Contacts" and filter your list by any contact or company field in Spiro such as city, state, title and more or opportunity stage. Select which contacts you would like to add to your list and click "Add to campaign". There is a limit of 500 contacts for each campaign. Now that you have added contacts to your list you can send a mass email or start calling the contacts on your list. 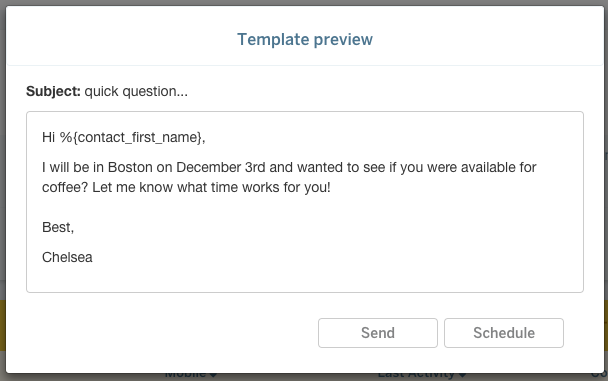 To send an email campaign, you must first create an email campaign template under settings. 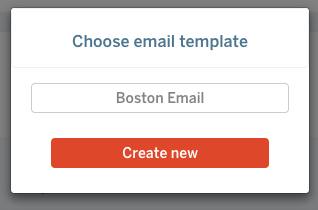 You can also create a template by clicking Send Email Campaign and then clicking "Create New." After you create your template, navigate to the campaign list and choose to Send Email Campaign. You can choose the send the campaign now or schedule the campaign to be sent at a later date. If you would like to use your campaign as a call list you can select "Start Calling" and the list of contacts will open in your Assistant allowing you to efficiently make calls using Spiro Voice and automatically log your activity. You can also access all of your campaigns lists right from the Assistant tab by clicking the gray Assistant bar to choose a campaign to call.